Awww, such a happy memory! I'm afraid my kindergarten teacher probably remembers me a little less fondly. Having brought a cocoon I'd found to school so we could all watch a 'butterfly' emerge imagine my surprise...and the teacher's horror...when we found thousands of baby praying mantises crawling around the classroom the next day. 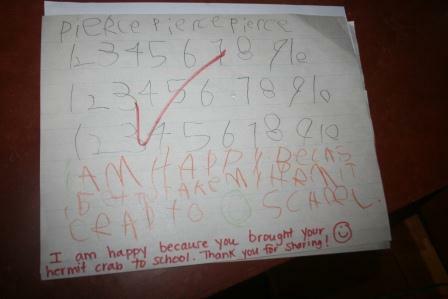 I daresay Pierce's teacher will have much happier memories of him! Thank you so much for your sweet comment by the by, it was very much appreciated. How exciting for him to get to show off Misty. LOL.... I guess he couldn't contain himself to get all his numbers practiced. What a sweet post. I had to giggle when I saw the homework. You can see how excited he was in that picture. So glad that he got to take Misty to class! So sweet! How fun that Misty got to go to school! Pierce takes good care of his pet, I can tell. I love the teacher's note! glad she was a hit! What a cute picture... Pierce looks so happy with Misty.... How cute!!!!! I enjoyed that story. 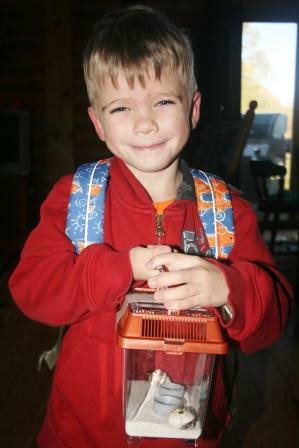 I love how kids get excited by simple things, like taking a hermit to school! Isn't he just cute? oh my gosh!!! I see he resembles his cute momma's smile. I love when guys get excited about sharing their interests at a young age. I work with the Cub Scouts at that is the best thing ever. Oh that piece of homework is one for the scrapbooks! My wife happened to go in his room and got to see Misty, she said he was being real careful that the other kids didn't hurt the crab. You have a real sharp little boy! Such a sweet story! I miss when my boys were little. It's weird but I still vividly remember having a hermit crab when I was 5-7ish. It must be something about HCs that stick in a kid's mind? Anyhow, I am sure he will talk about it for quite some time and that is super cool! Just not sure there's a whole lot cuter than this! That is so sweet. What a precious look on his face! Oh so sweet. I am sure all the children will remember the hermit crab for a long time. I think all young boys like things that crawl. Hope you have a great day. Love his paper from school. He was definitely excited to bring Misty to school. I bet it was a great day for him. What an exciting day that must have been for him. Oh Lord, I never even thought about the day Deaglan's going to want to take something live! So far the weirdest thing he wanted to take for his show and share were chicken bones from the night before's dinner.